A nice stroll, and whilst it’s never pleasant to be on the moors in inclement weather, this walk is slightly more forgiving than some of the tussock-hopping that can be enjoyed elsewhere. You get a good mix of moorland, easy tracks, woods and fields, and walk past some big history in the ruins. There’s a lay-by right at the start of the footpath. Park in the lay-by at Wilcock’s Farm. This is an old building, and you can see remnants of Latham’s and Butter Cross here, too. Take the signposted footpath along the well-made track and follow along, with Lead Mines Clough visible to your left, and Rivington Pike to the right. You will come to another gate, where you dog-leg left here to walk in the same general direction but with the woodland to your right. The signposting isn’t great here, but the surroundings are. You will probably hear meadow pipits all year round, and more depending on the time of year. When you reach the end of the woodland, take the gate right. Here you can stop and explore the ruins of Brown Hill Farm – can you make out any walls? From here, go up the hill to the green signpost, and turn right to head towards the road to Moses Cocker‘s. As you approach the road you have a choice of paths. Looking on the map it may be tempting to take the footpath back, but I have chosen the road route for a couple of reasons. Firstly, the signposting on this track is terrible and there is lots of barbed wire and cattle around… Secondly, by continuing on, just before you get to the road you can see a woodland gate to your left, which is another spot to explore! When you do arrive at the road, head down the slope then follow the tarmac right, and you can see remnants of marine band fossils in the stream that runs under the road. Take a look at Moses Cocker’s on your way past – an old, old house with a long history. It survived demolition because it is located on a main road, whereas the Liverpool Corporation put paid to the moorland farms. Take the sharp right at the T-junction, then follow round to the right and drop down the hill to meet Dean Wood. There are stories abound here, I will be creating a page just about Dean Wood in time, but for now there is a lot to read in the piece on Turner’s Farm. It’s a nice walk along here, with a gory story if you read the article! Half way along the woodland the path dog-legs on to open fields, where you can head for the nearest corner of Yarrow Reservoir and look for evidence of Turner’s Tam Pits. Carrying on this straightforward path you can enjoy the expansive views before arriving at another ruin – Anderton‘s – with more history and tales. A good spot for a brew if you haven’t taken one yet! Then it’s a gentle uphill stretch to the main road. 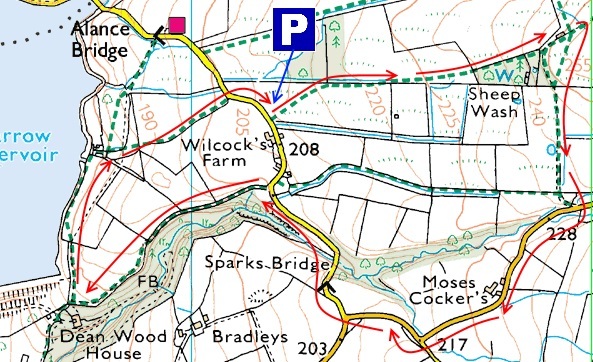 As you approach Wilcock’s Farm, you want to head slightly left of the buildings to pick up a footpath sign in the distance.